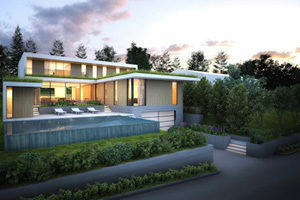 The design team at Marken D+C is currently finalizing the building permit submission for this innovative Zero Energy Residence in North Vancouver, Canada. Variance Permit has already been approved on the height and FSR relaxation, given that it will be built to Passive House Standards taking full advantage of the sustainability incentive offered by the municipality. The modern west coast themed design aims to meet the 2nd highest Passive House category – Passive House PLUS – producing almost as much energy via Photovoltaic energy production than the building uses over the year. Also, excess energy produced will be stored in Tesla’s powerwall battery and fed back into the electric grid. Later, when the PV panels aren’t producing enough electricity, the homeowner can use the electricity stored in the battery instead of having to buy it from the utility, plus this system provides back up power in the case of a power outage.